CO Building Systems operates out of a nearly 200,000-sq.-ft. facility, which houses automated beam-production lines and an array of fabricating equipment that turns master coils of steel and aluminum into framing, subframing and sheeting components. So notes an online blog post from ERP-software provider Abis, describing eight ways in which metals-related businesses can leverage ERP software to improve their inventory-tracking capabilities. Case in point: CO Building Systems Inc., Ephraim, UT, a manufacturer of pre-engineered metal buildings for a variety of applications including agricultural, commercial and industrial. The firm operates out of a mammoth production area encompassing nearly 200,000 sq. 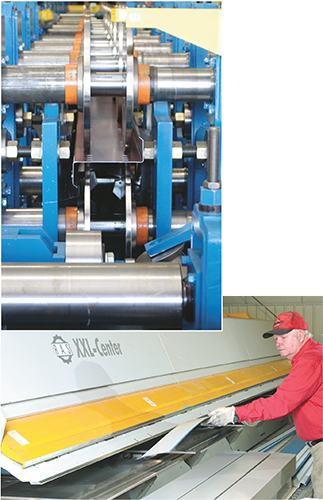 ft., which houses automated beam-production lines and an array of fabricating equipment. Some 70 employees operate and oversee the equipment to turn master coils of steel and aluminum into framing, subframing and sheeting components (in a variety of colors), subassemblies, and assemblies. It all gets precisely packaged and delivered on trailers to onsite construction sites around the continent. As each department within the operation handles a unique subset of each metal-building project (main framing, secondary framing and sheeting), the overall schedule through the shop requires production to be broken down into batches of parts for multiple jobs. Typically, each department produces parts in batches that encompass work for around eight different jobs. Then, the parts are parceled out by the unique job and loaded onto flatbed trailers for delivery to the job sites. “Managing that flow of material and parts, ensuring that the right parts—and the right number of parts—ship to each job site can leave a lot of room for human error, when managed manually,” says CO Building Systems’ purchasing manager Matt Mitchell. With construction crews awaiting trailer loads on-the-clock at the job site, the last things an owner or contractor wants are inaccurate part bundles. Double- and triple-checking cut lists and packaging can leave a lot of room for human error, and so early in 2014 the company sought an automated, software-driven process for managing its material flow, production, packaging and shipping functions. Its ERP system of choice: Adjutant, from Abis. One source of human error, prior to implementing Adjutant: loading the wrong coil of material onto a production line. 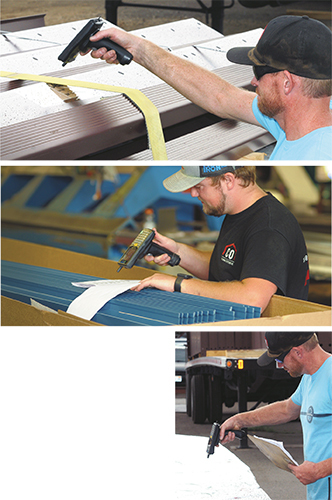 Bar-code scanning, with data processing handled through Adjutant, throughout the production, packaging and shipping process eliminates a great deal of human error. It prevents the wrong coil from being used; ensures that companion off-the-shelf parts (hardware items for example) that accompany each order for fabricated-steel sections precisely match what is called out on the bill of materials; and ensures that the correct part bundles--framing, subframing, hardware packages and sheeting—get loaded onto the truck-trailers. Similarly, Adjutant helps ensure that companion off-the-shelf parts (hardware items for example) that accompany each order for fabricated-steel sections precisely match what is called out on the bill of materials, or packing list. With Adjutant, Abis offers numerous additional software modules developed specifically to support steel processing and made-to-order manufacturing, and Mitchell and his team continue to evaluate these options. Among them: Shop Floor Routing, CRM, Wireless Warehouse, Bill of Material and Work Order Management. “One additional and valuable application within Adjutant,” says Mitchell, “involves work-order management and shop-floor control, to help us manage smaller orders, rather than large all-encompassing projects. Here, where maybe we need to manufacture just a handful of trim parts or sheeting, we use Adjutant to prepare the quotes and process the orders through the shop. Adjutant helps with these smaller jobs because it provides a window for our sales force into the inventory of parts we might already have on hand to satisfy a particular order. It provides visibility into our work flow. These types of jobs—partial orders that often will consume products already in inventory —represent 15 to 20 percent of our total volume, and we see, thanks in part to the capabilities of Adjutant, opportunities to grow this part of our business. “We’re also, with Adjutant, able to collect real-time consumption reports,” Mitchell continues. With that type of visibility into its product flow, he says that the company can more accurately project what it needs to purchase, based on what it has already sold.